With the ever-increasing cost of a 30-second TV spot during today’s Big Game, the ad industry once again finds itself asking whether the massive investment is worth it. Ad trades run thick with articles that are heavy on speculation and qualitative analysis, but relatively light on real data. They praise the creative excellence of the ads without providing a rigorous examination of their impact on sales or an attempt to isolate the effects of the Super Bowl scientifically. This analysis is an attempt to do just that -- by focusing on the impact Super Bowl ads have on a brand’s measurable direct response effects. Specifically, how the halo of the widespread exposure to these ads impacts actual sales by analyzing the impact of Super Bowl advertising on mobile and display conversion rates for Super Bowl advertisers in the weeks following the game. 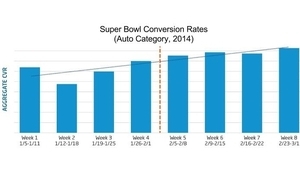 To do that, we compared conversion rates in the weeks leading up to and following the Super Bowl in 2012, 2013 and 2014 for two control groups of advertisers -- ones that advertised in the game and ones that did not in the same category -- automotive. A total of 10 campaigns were analyzed. For the purposes of this analysis, conversions were defined as someone performing actions on the advertiser’s Web site, such as locating a dealer, signing up for a test drive, or browsing inventory. Initial findings appeared to support the notion that Super Bowl advertising had a positive impact on conversion rates. Auto advertisers that advertised during the game averaged 14.9% higher conversion rates in the four weeks following the Super Bowl (February) compared to the four weeks prior (January). This effect was even stronger if they were not advertising a luxury vehicle. If Super Bowl advertising was actually driving greater conversion rates due to a sort of halo effect, then we might expect to see a significant increase immediately following the game, rather than a gradual upward trend that appears to have started in January. This led us to investigate the standard sales cycle for cars over that same period. Using data from Edmunds.com for sales in early 2014, we found that this increase in conversion rates simply mirrors the monthly industrywide sales data. This suggests that auto advertisers get little to no additional value from their February advertising as a result of Super Bowl advertising. An analysis of luxury vehicles showed slower post-Super Bowl growth in the same fashion, leading to the initial notion that non-luxury vehicle display ads might benefit more from Super Bowl advertising. Some might suggest that the value of a Super Bowl ad can’t be determined online. However, prior research from Rocket Fuel, eMarketer, and JD Power suggests that auto buyers primarily research potential purchases online in the weeks prior to visiting a dealer. As a result, we would expect to see an increase in campaign conversion rates that focus on these research actions on dealer Web sites as a result of Super Bowl advertising in the weeks following the game. During the 2014 Super Bowl (6 p.m.–midnight, EST), we saw more than 2.5 billion bid requests across the display, mobile, video, and social media channels from 81 million unique users in the United States. 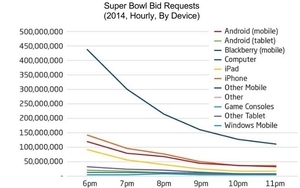 Requests decreased every hour every hour through The Big Game’s run time, with little variation by device. This may be due to the record number of eyeballs fixated on the game: In February 2014 Nielsen reported a record number of viewers for the 2014 Super Bowl halftime show: 115.3 million, more than the game itself. While it’s logistically impossible (and potentially undesirable) to win every bid for media that is made available on the exchanges (although you could get pretty close with the right bid amounts), we can still imagine a hypothetical situation where, by placing the maximum bid, an advertiser wins every single available bid during the Super Bowl — all 2,542,573,344 opportunities. Assuming an average net cost of $1.50 cpm for that inventory (with high bids to capture more valuable inventory), this purchase would cost an advertiser $3.8 million — $700,000 less than those 30 seconds of TV ad time during the Super Bowl itself. While the brand metrics may differ, we believe this method could be slightly more effective at generating conversions and online sales, particularly among consumers who aren’t watching the Super Bowl broadcast for the 30 seconds during which the ad airs. Moreover, with such a massive online burst of audience reach, an advertiser could then deploy tried-and-true up-sell or reminder marketing techniques across all digital channels, rather than the one-and-done effect of a Super Bowl ad. Even a more traditional media-buying approach would yield some interesting opportunities. As an alternative to buying every piece of biddable inventory, for the same cost as a 30-second Super Bowl TV spot, digital advertisers can also buy an 11-day takeover of the YouTube home page, a nine-day takeover of Turner Networks’ affiliated Web pages (which includes TNT.tv, CNN.com, NBA.com, AdultSwim.com, etc. ), 45 days of stand-alone ads on Facebook’s logout page, and more than 37 days of sponsored trending on Twitter. Those advertisers particularly interested in diversifying can just buy every one of these items for three days, reaching more people for longer periods. Interestingly, it would appear that auto advertisers are wising up to the idea that without measurable ROI, perhaps it's time to focus their advertising efforts elsewhere this year. According to the Detroit News, there will only be five auto advertisers for this year's game — the lowest since 2010. By comparison, the 2014 Super Bowl had 11 automotive brands. 2 comments about "The Super Bowl Of Deflated Expectations". Scott Fasser from Hacker Agency, February 2, 2015 at 10:29 a.m.
Best analysis of SuperBowl ad impact on direct response I've seen. Thank you for putting this together. Charles Pinkerton from Theseus Communications, February 2, 2015 at 2:26 p.m. This reminds me of the old false syllogism: My dog has four legs, and my cat has four legs, therefore my dog is a cat and conversely then all cats must therefore be dogs. You are playing pretty fast and loose with the data and using huge jumps in logic to get to your conclusions. Unless I'm missing something the purchase cycle for a new car is about five years, in other words, people don't just see an ad and go buy a car. So you aren't going to see an immediate bump nor even one comparable to year ago data. The reason a car manufacturer advertisers on the Super Bowl is because the brand and model will be seen by more people than anywhere else and when the time does come to make a purchase the consumer will think "hmm what about brand X?" Equally media channels don't operate the same way on the human brain; to say that 2.5 trillion impressions with what would be standard display purchased programmatically, (I'm assuming both by your pricing) isn't feasible because not all ads would be on the marketplace programmatically and therefore your pricing assumptions are illogically low, and, even if your pricing assumptions weren't absurd, I would bet you that car that you think didn't sell during the Super Bowl that more people would come away from the TV spot remembering that ad and the car than those exposed to standard internet/mobile display advertising half of which probably wouldn't even be in-view. And I'm sorry but 3 days of YouTube, Turner Networks and Facebook and Twitter aren't going to work as well either. GM pulled their advertising from Facebook because it didn't work, and the jury is still out that Twitter can do much of anything for a brand be it a car or otherwise. Additionally, even if you put that aside, by my figuring one would only "expose" the ad to, at most, 25-30 million people. That's very short of the 49.7 rating that the SuperBowl achieved -- in fact it would be less than half. Finally, there is the fact that none of us would be sitting here writing about a 3-day take over of YouTube the next day and thereby creating billions of new mentions and impressions for the game and the brands in the game all of which go unaccounted for in the model.